Right now this is my favorite stamp set~by Darkroom Door!! The journal lines on the tag are by Wendy Vecchi~love her stuff too!!! 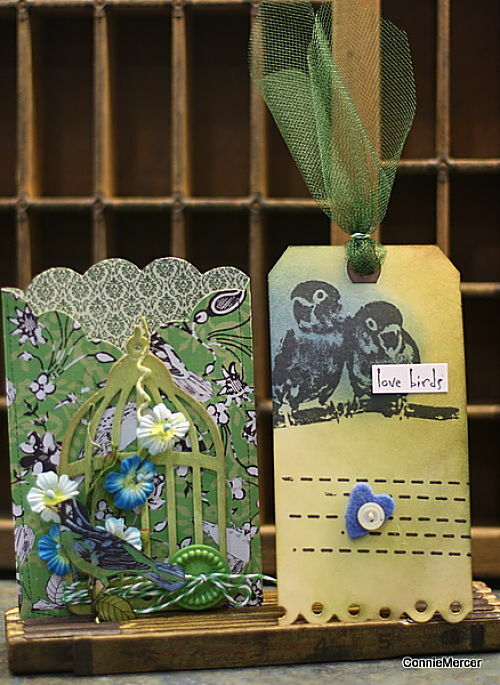 I'm sure you recognize the bird cage if you don't it is Tim Holtz. The awesome paper is by G. C.D./Melody Ross. I bought this at a Scrapbooking Show locally and boy, wish I had bought more. Love the birds!!! Same ingredients except the bird cage is by Darkroom Door. I used some Jenni Bowlin journal spots on this one and hand cut a felt heart!! I used Ranger inks on both of them. The netting is an added "treat". I love how it just makes the project immediately "fun"!! Thanks for stopping in today and have a great day!!! I have a busy weekend coming up, but a super fun weekend~hope to get lots of work done too!!!! these are so pretty! and I love the way you display your stuff! My grandfather had one of those foldable rulers....seeing that brought back such fond memories of him! These are GORGEOUS!!! 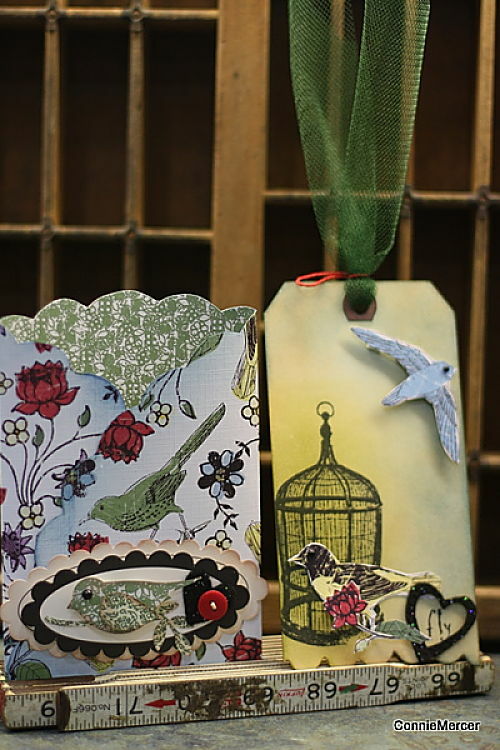 The papers and embellishments are so yummy. :) You are inspiring me! Love this and that paper! I'm a serious Wendy Vecchi, Studio 490 fan! You did an awesome job and loving the birds pock cards. Ooh Connie I love them! I have a soft spot for birds but these are really gorgeous. Great work! These projects are great! So happy to find out your blog! I enjoy a lot!